GraceConnect » Davey Ermold Begins Ministry in Winchester, Va.
Davey Ermold Begins Ministry in Winchester, Va.
An article in today’s Winchester, Va., Star, welcomes the new pastor of the Blue Ridge Grace Brethren Church, a Charis Fellowship congregation in that city. A portion of the story appears below. Click here to read the complete article. Davey Ermold, 34, sits in his office at Blue Ridge Grace Brethren Church, which is on Cedar Creek Grade. The minute Davey Ermold saw this pastor’s office at Blue Ridge Grace Brethren Church he felt at home. With plenty of shelving for his books and a quiet place for study and prayer, the office was an ideal place to start his ministerial career. Ermold, 34, began serving as the new pastor at Blue Ridge Grace Brethren on July 2. 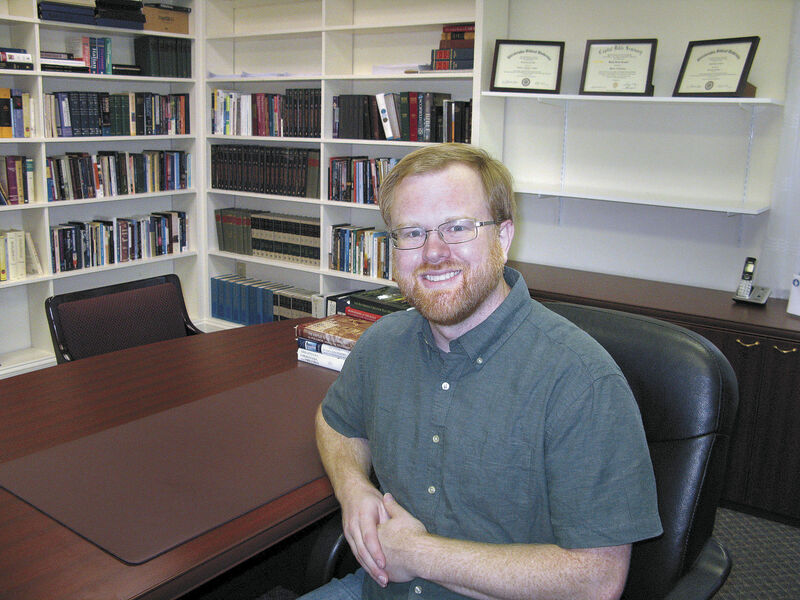 “My prayer for this congregation is to preach the gospel and to find and work with those missions that best serve the people of Winchester,” Ermold said from his new office — the shelves already filling with books. The church is situated on 10 well-maintained acres off Cedar Creek Grade, just outside the city limits. Blue Ridge Grace Brethren is an evangelical church that emphasizes the authority of the Bible. “We are Bible believing and Gospel preaching,” Ermold said. The Fellowship of Grace Brethren Churches, recently rebranded as Charis Fellowship, is a voluntary group of churches. Each church chooses its own pastor.